Largemouth bass photo from U.S. Army Corps of Engineers. This black bass (an elongated sunfish) lives in quiet, vegetation-rich Florida waters and can grow to over 20 inches (and weigh over fifteen pounds). Adult largemouth bass are active predators in the aquatic ecosystem, feeding on other fish and large invertebrates (such as crayfish). Large bass will also prey upon smaller bass. The Florida largemouth bass is distinguished by a deep notch in the dorsal fin - It can reach a length of more than twenty inches and weigh more than fifteen pounds. 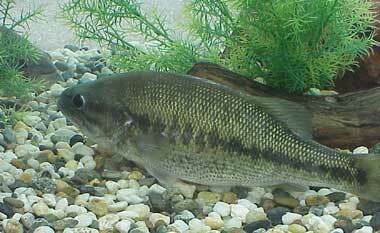 The largemouth bass is also a state symbol of Alabama, Georgia, and Mississippi. Largemouth bass sketch by Duane Raver / U.S. Fish & Wildlife Service.